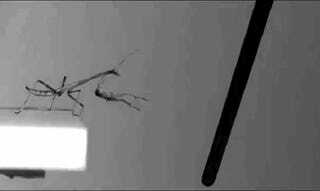 This slow motion clip of a jumping praying mantis is by Gregory Sutton, one of the authors of a study on how these insects manage to precisely target and hit their jumps. They need to be able to move their abdomen, hind legs, and front legs. Just one immobilized, like in the clip, and things go wrong. In "Mantises Exchange Angular Momentum between Three Rotating Body Parts to Jump Precisely to Targets" published Thursday in Current Biology, researchers showed that "when making targeted jumps, juvenile wingless mantises first rotated their abdomen about the thorax to adjust the center of mass and thus regulate spin at takeoff. Once airborne, they then smoothly and sequentially transferred angular momentum in four stages between the jointed abdomen, the two raptorial front legs, and the two propulsive hind legs to produce a controlled jump with a precise landing." the target distance was reduced, and the angular velocity of the trunk was measured. If the mantis is adjusting its rotations, then a shorter jump would have to be accompanied by a faster angular rotation of the trunk to align properly with the target. When jumping to a target one body length away, there were no anticlockwise rotations of the abdomen and the hind legs that occurred in periods II and III in jumps to the more distant targets. The mantis now rotated 64% faster at 1.4° ± 0.2° ms−1 and spent 66% less time airborne (44.9 ± 3.8 ms) while still landing precisely on the target (mean of means for six sixth instar mantises each jumping three times, compared with 13 jumps by five mantises jumping to targets at 1.5–2 body lengths). The absence of leg and abdominal rotations here, accompanied by a higher rotation rate of the trunk, thus confirms a role for these rotations in reducing whole-body spin in the longer jumps and also suggests that they are under active muscular control.